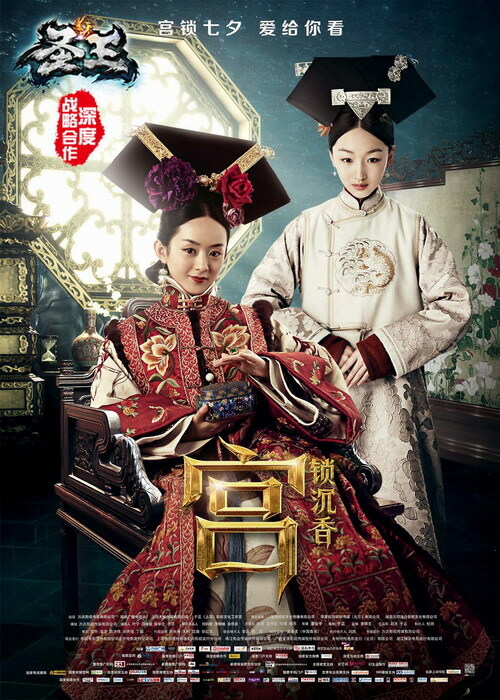 So Zhu Dong Yu was actually discovered by Director Zhan Yi Mo (Raise the Red Lantern, Red Sorghum, discovered Zhao Zi Yi and Gong Li, basically worshipped in China). He’s like the stamp of success to be discovered by him. 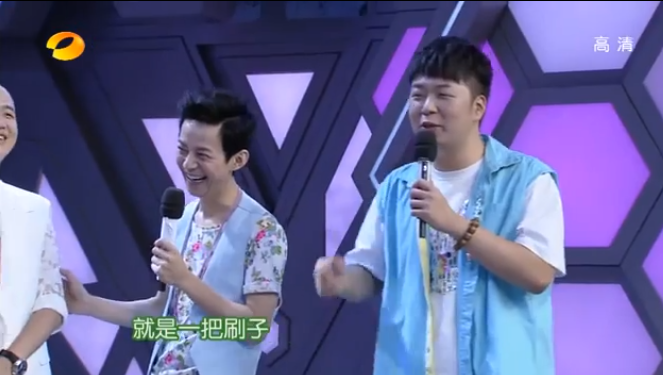 They start by making fun of Zhu Zi Xiao’s eyebrows, which are ridiculously thick. They ask him if he’s got a drama or work that needs his eyebrows that thick, his eyebrows are literally bigger than one of the host’s eyes. 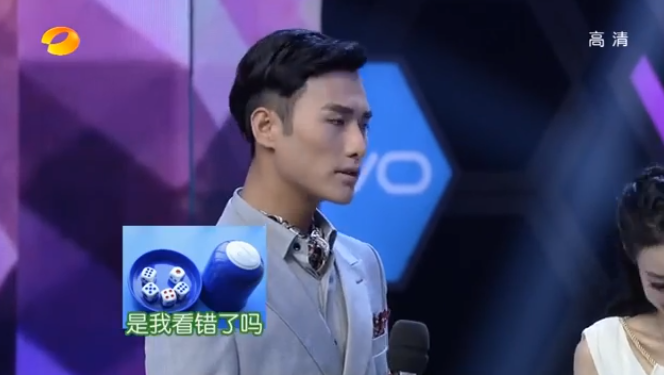 Zhu Zi Xiao answers that it’s a kind of style (Feng Ge) but one of the hosts quips that it’s more that his crazy (play on the word Feng). 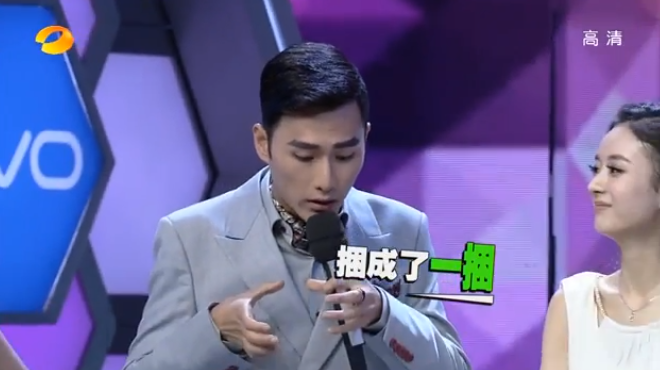 One of the hosts points out that Chen Xiao has really thick eye brows but compared to Zhu Zi Xiao’s, Chen Xiao practically has none. 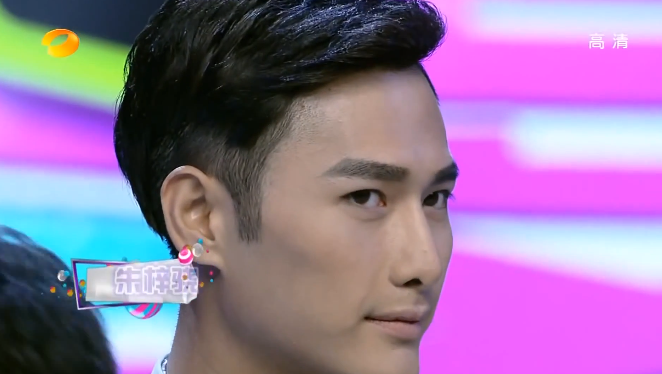 Zhu Zi Xiao answers that he likes to collect eyebrow pencils for every drama. He says that other people has regular make up in their ancient drama kits but in his bag, he has a giant bundle of eyebrow pencils, and with every drama, his brows get thicker and thicker. One of the hosts says that in ten years he’ll have enough to make a giant brush and all he has to do is take the giant brush and draw it on his face. Chen Xiao tries introduce the movie but the hosts tease that they’re more interested in his relationship with Zhao Li Ying. Everyone in china is practically trying to bring the two together. 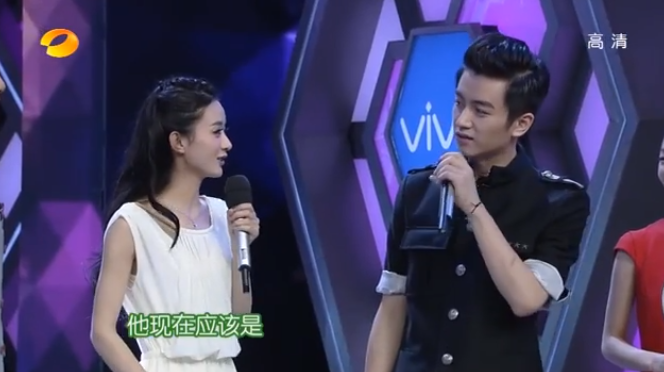 The hosts asks Li Ying if she and Chen Xiao were together, and Li Ying says that they arn’t. 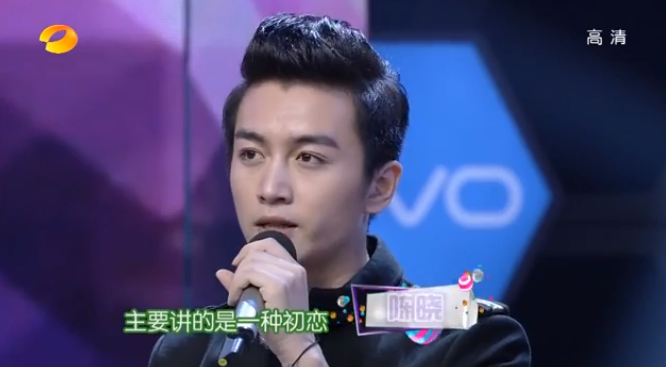 Chen Xiao tells the hosts that he and Li Ying have been through a lot together and he will always enjoy/cherish their relationship. 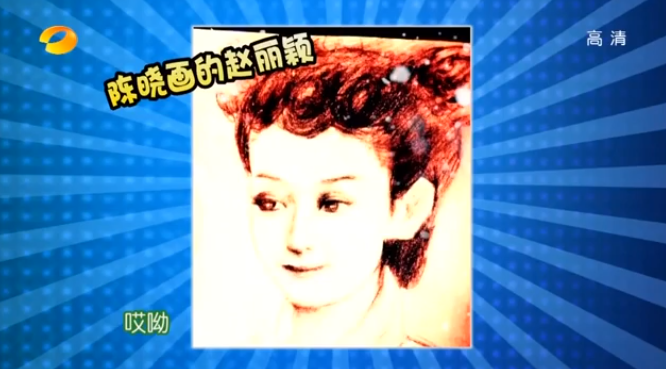 Chen Xiao loves to draw and has even drawn Li Ying. 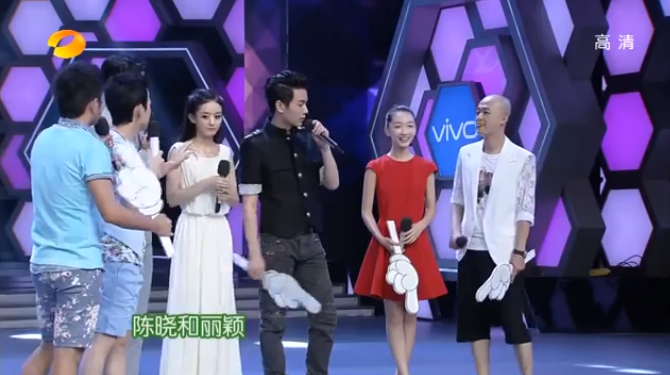 The hosts asks newcomer Zhu Dong Yu if she recieved any encouragement from fellow actors and she said that she did. 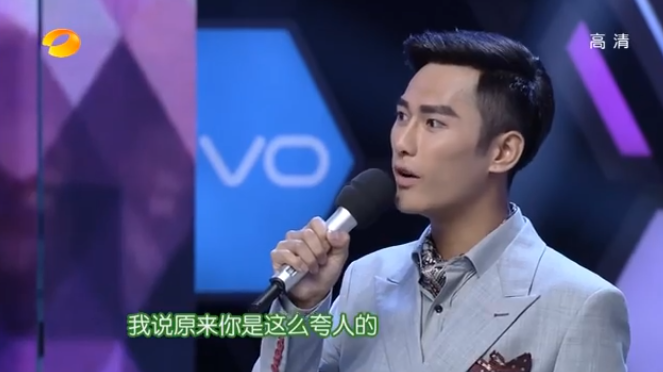 One actor told her not to be nervous, since he’s been on the program and knows the hosts, he even sent the hosts WeChat message regarding Zhu Dong Yu’s nervousness. *WeChat is a popular app in china where people use the apps basically to leave voice messages and texts to each other. 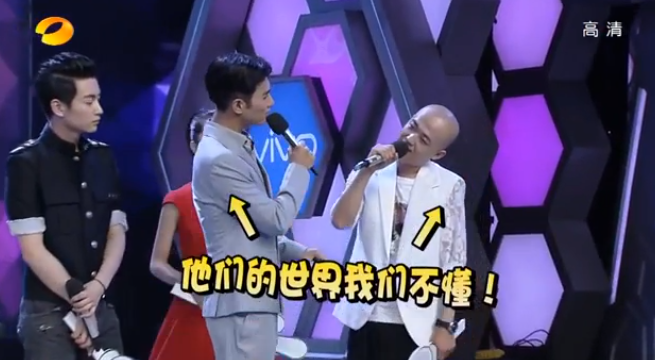 It turns out the male actor is Lin Geng Xin (17th Prince from Bu Bu Jing Xin) The hosts tease Lin Geng Xin for trying to show off to Zhu Dong Yu that Lin Geng Xin knows all the hosts. 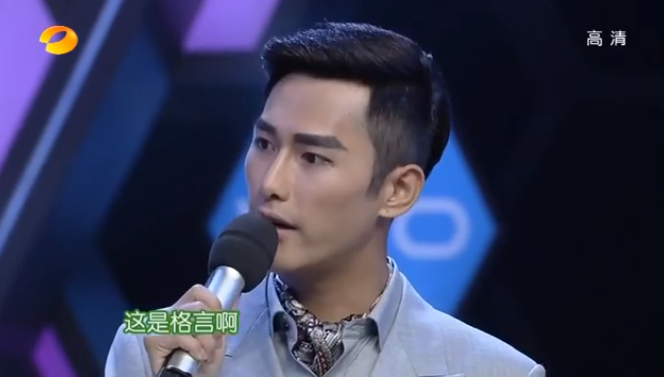 The hosts interrupt and remarks that Zhu Zi Xiao’s eyebrows isn’t all drawn in, he actually has eyebrow hair too, they also marvel at the short distance between his eyebrows and his eyes. 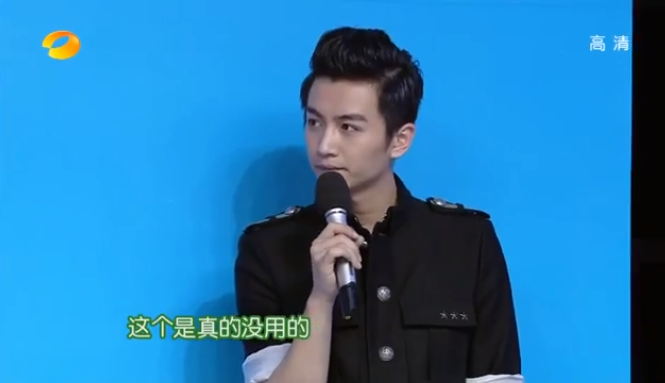 The hosts ask Chen Xiao why did he point to Bao Bei Er. Chen Xiao replies that when men give gifts, they tend to give manly things, like eyebrow pencils (his jab at his co-star Zhu Zi Xiao who rolls his eyes) but Bao Bei Er gave Chen Xiao a ridiculous pair of Santa socks with white fuzz on top. When Chen Xiao went to go watch a movie in Bao Bei Er’s room, Bao Bei Er wore tiger pjs. 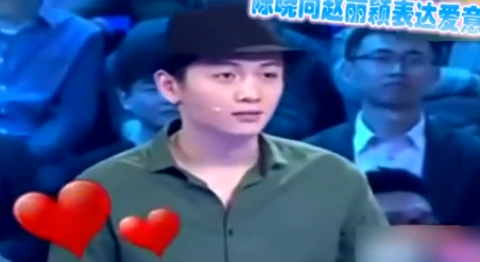 Zhu Zi Xiao cuts in and talks about how he and Bao Bei Er pretend to play imaginary dice in the car. They shake their heads and imagine number in their head and then blurt it out. The loser drinks make believe wine. Oh My God. They all ask why did Dong Yu not point at anyone, she stammers, “Zhu Zi Xiao, at the start of the movie, gave a coat worth 200 RMB.” (Which is really really really cheap) The hosts look at her in awe, they’ve never heard Zhu Zi Xiao give anyone a gift, let along a 200 RMB one. Zhu Zi Xiao says proudly that he found it on sale and even bartered it too. 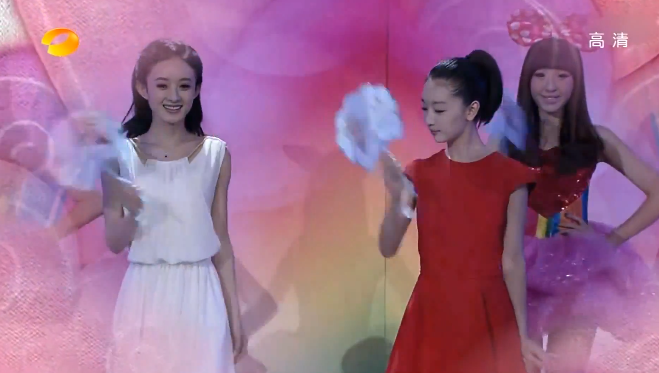 The girl host says that in all their years, Zhu Zi Xiao has never given any of the hosts gifts. 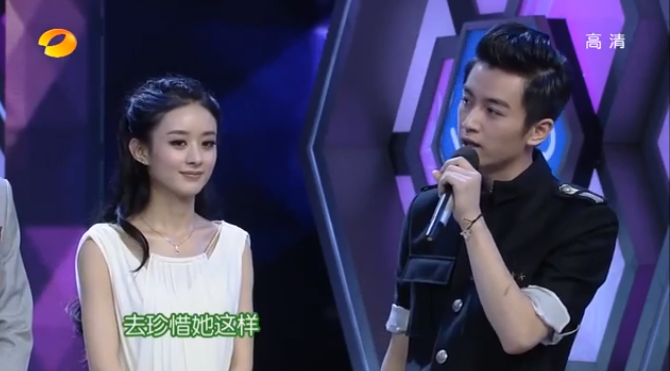 Zhu Zi Xiao says that he invited them to kareoke didn’t he. She shoots back that it’s because he ate all the food at the karaoke. He tries to defend himself by saying that he came dressed like a prince today, they can’t say that he’s cheap. They say that he has money, and he’s cheap. His motto is, “If I can’t find money, then I’m losing money”. How can you find money every day, they ask him? Zhu Zi Xiao tells them that by not spending money, he’s basically not losing money. They stare at him in awe. Bao Bei Er tells a story about how Zhu Zi Xiao is miserly. Zhu Zi Xiao lives in a very nice neighborhood and drives a good car. But instead of parking in the neighborhood, Zhu Zi Xiao parks in the mall next to his neighborhood, because parking there is free. He walks to the mall everyday when he needs to drive. I just spat water on my screen. The next game is adorable. 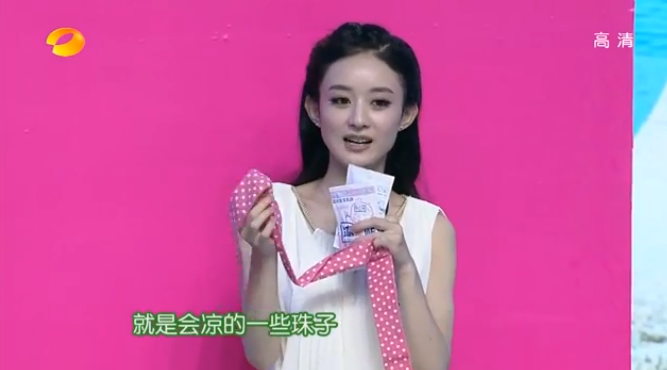 The 5 actors have 30 seconds to advertise an item and the hosts vote whether or not they would buy the item. 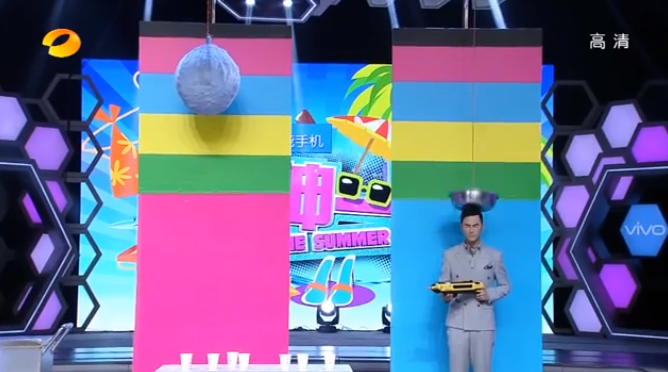 If three hosts agree to buy the item then the actor would not get hit by a heavy object dangling above them. 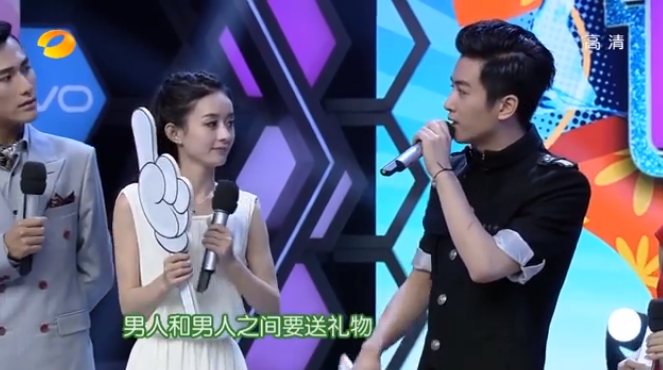 Zhao Li Ying didn’t get the votes, and the hosts keep trying to get Chen Xiao to come and take her punishment for her. In the end one of the hosts takes the punishment for her. 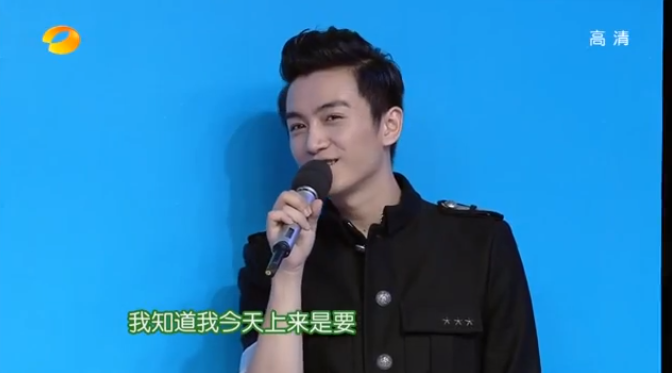 Chen Xiao doesn’t get the votes and he smiles and says that he deserves punishment, for not rescuing Zhao Li Ying earlier. The judges aww, and let him off for that. The group is all rewarded for their participation with a plate of chilled craw fish. Chen Xiao does this cute thing where he takes takes the shell off the crawfish and feeds it to Zhao Li Ying. Then he keeps feeding her. It’s adorable. So that was all the cute and funny in the episode. I love the interaction of the cast and it was a great laugh. Thanks for translations!! 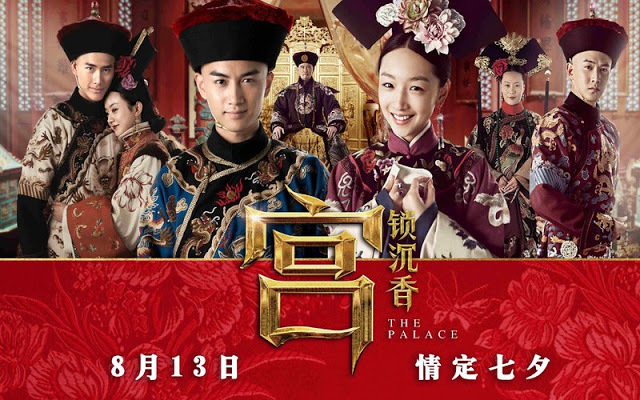 I love when the casts come up for shows 😀 Zhao Li Ying is so quiet when she is on these programs though… It’s a stark contrast to her acting self. 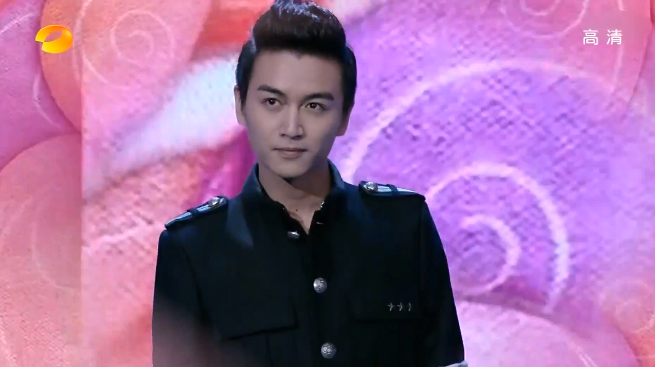 Never knew Zhu Zi Xiao had such an interesting side to him haha! Zhu Xi Xiao was so sassy, he was adorable pants. But those eyebrows, any thicker and they could be bangs. omfg! just date already! I’LL BACK OFF if they can be together! if not I want HIM!